This month we invited companies to tell us about their alternative solutions for venues who want to provide accessible toilet solutions for people who need a changing bench and/or hoist. This week features MigLoo … and here is what they told us. Mobile, set up/take down system as and when required. A gantry hoist system with a changing bed and camping technology for sink/toilet supply. Contact: Leave a message or telephone us on 07789 147663. Director John Robinson’s concern at the difficulty people experience in finding suitable facilities. He started out by inventing a mobile Changing Place for Andy Loo’s in 2006. He got one of the very first Changing Places Awards during the launch of the Changing Places campaign at the Tate Modern, in 2006. John then realized there was a huge need for facilities that people could take with them. This gave him the idea of inventing an inexpensive yet completely versatile and fully mobile solution to these needs. This led to the three products we have today. Why do these facilities make such a difference and what do customers and users think of them? Operation with MigLoo’s mean that facilities can be put where people need them, rather than having to seek them out. They also are low cost making it easy for people to make those ‘Reasonable Adjustments’ required under the Equality Act. Users of the facilities (which means carers as well as wheelchair occupants) are delighted by the MigLoo’s and often moved emotionally that they can stay for a full event or that someone has bothered to provide what they need. We’re deeply moved by this and extremely motivated to develop MigLoo’s and the many other inventions in the pipeline. How long have you been running and where are you based? We started off in 2005 when John Robinson gave up his job running Pershore Day Care Centre to develop his inventions. Co-director John Morgan joined him in 2009 and the parent company, Protorus Solutions Ltd, was formed in 2014. However, the current MigLoo operation commenced in late 2017. The entire MigLoo manufacturing, production and operation is based in Pinvin, in darkest Worcestershire. How many types of arrangement do you have and what areas do you cover? We cover the whole of the UK with sales. We prefer businesses and organisations to buy MigLoo’s because of their very low cost. However, we also make some MigLoo Festivals available for hire when we have the capacity to do so. The MigLoo Freedom (above) is 2m x 3m and has a changing bed, gantry with hoist and tent to cover. This means it is small and light and can be erected on fairly level sites by 2 people virtually anywhere. The MigLoo Festival is 4.5m x 3m and is an accredited Changing Place. It has everything that other Changing Places have, including a sink, water from a tap and a loo. It is self-sufficient, being independent of mains water or electricity, using camping technologies, which make it incredibly flexible and cost effective. The Naked MigLoo is simply the MigLoo Festival without the tent structure. What we are doing here is providing pop-up Changing Place facilities that can be put into an empty suitable room ANYWHERE! From businesses through shopping malls, supermarkets, museums, local authorities, empty shops on High Streets – essentially opening up huge amounts of otherwise redundant spaces into accredited Changing Places for profoundly disabled people to use. We’re seeing this as a temporary solution to the lack of facilities; they are low cost making them a very reasonable adjustment and helping to prove the need for permanent facilities to be installed. We also realize that MigLoo’s can also enable organizations to find the optimum site for a Changing Place, thus avoiding the embarrassing situation that some businesses/authorities have made in putting them in locations that few will use! Because of their extremely low cost, Naked MigLoo’s are also perfect “standby” Changing Places for when the permanent Changing Place breaks down. A Naked MigLoo takes only 30 minutes to be erected and become fully operational. Can they be installed/hired for a few days or nights? Yes. We will hire them out for anything from 1 night to many, although installing at a great distance simply isn’t feasible or cost effective as it would be too expensive for a relatively short period. 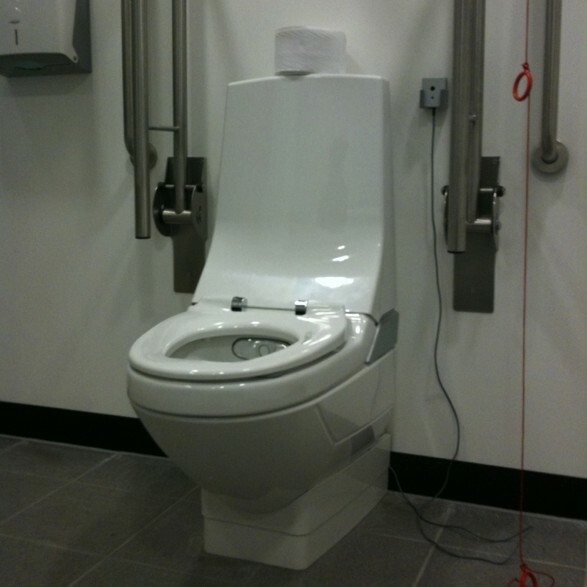 Does anyone stay with the set up to help learn how to use that particular hoist/gantry or empty commodes etc? No, not really. The equipment is easy to use and we make sure hirers are trained, thus having someone who can advise on hand when folk use it. We sort the waste out. Can any disabled person or carer use your facilities or are they only for hoist/bench users (and their carers/assistants)? This is really for the event organizers. The Elsan loo we have has armrests and a backrest and is designed for those who need support, but there are not the grab rails you would find in an ordinary wheelchair loo. The organisers may well feel that users with profound disabilities should have priority and should not have to wait for someone in a wheelchair, who has an alternative loo. For people who might use them, would they be allowed to leave their sling with you in a locker or do they need to carry it around the venue? They would need to take the sling around with them, as we have no locker, but it is something we could consider. By the way, it is looped slings that fit our hoists. This is because most people use this type. We could cater for clipped systems, but this would need advance notice and be a little more expensive (as they are not used very much). What types of venues have you been to and how do people know if you are attending? Here’s a list of what we’ve done so far; Fun Days in a football club, Fetes, Disability Awareness Days, Children’s Play Schemes, College Events, Exhibitions, School Events, International Theatre, Conferences, 7 day Festivals….. We put the events on our website and social media and make sure the organisers advertise that a Changing Place will be available; after all; ‘If you billed it they will come’ – but not if they don’t know about it! If I wanted one for a day at my event/venue, what space would I need and where is the best place to have one e.g. inside the event, in the car park etc. The MigLoo Freedom is 2m x 3m, the MigLoo Festival 3m x 4.5m but some space is needed around the structure for guide ropes if it is windy. It is best to put the facility as near to where it is needed where people are, rather than making them have to go some distance away (it’s often hard work wheel chairing!). Do I need a permit or special insurance to have one near/in my event? No, though we would ask that you insure the facility, just to cover any damage. Our parent company, Protorus Solutions Ltd carries £10m in public liability insurance. How can people find out the cost of hiring a Migloo arrangement and attendant? Just go on our website www.migloo.co.uk and leave a message or telephone us on 07789 147663. We don’t provide an attendant as this will push the costs way up and normally the event puts someone in charge. Carer’s also know what they need to do when they see the very familiar set up inside the MigLoo. We could consider this, however, and supply an attendant if necessary. What do you hope for the future of Migloo? Simply to support as many people that need it as quickly as possible. There is a desperate need in the UK for these facilities as we have all seen in recent national TV and other media coverage. Our MigLoo family offer real “reasonable adjustment” and the Naked MigLoo is potentially a game changer, changing many many lives for the better, once it has become more recognized. We would also like the low cost MigLoo concept to be taken on by the “event loo” industry in the UK and make it available to other countries. As MigLoo grows, we will employ staff to run the operation.